Adobe Spark is an integrated suite of storytelling applications for the iPad, iPhone, and web developed by Adobe Systems. Its apps became the company's first to be named by Apple as an App Store Best App of the Year and has been downloaded over 3.5 million times. 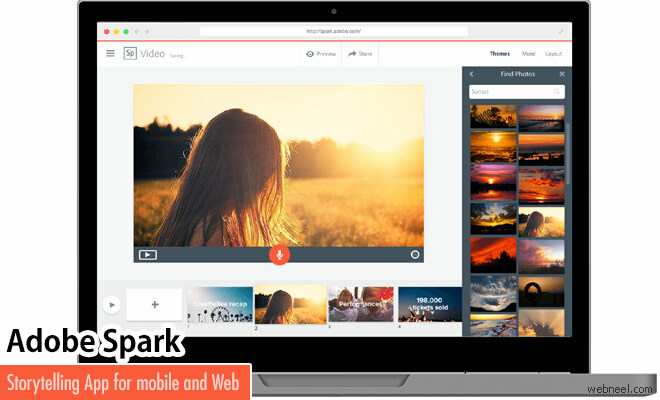 Spark consists of a Web app with three main tools—Post, Page, and Video—each with companion mobile apps. The three tools create social memes, mini websites, and narrated tutorials, respectively. In a way, Spark is an attempt to capture lightning in a bottle: Purpose-built viral memes are a tall order. Spark can serve as a valuable tool for small businesses, bloggers, marketers, and students who want to get a message out with style. With the addition of new features, adobe spark app is now more in line with the others apps like Instagram, Flipagram and GoPro Quick. Once logged into the Spark site, there are three simple choices represented by large, colorful buttons: Post, Page, and Video. Each option has plus sign and a short description. The Post tool is designed to help you create a social meme; Page is for portfolios, catalogs, and info pages; and Video is for tutorials and presentations.